Prada has launched Infusion de Mimosa, a new addition to the Les Infusions de Prada collection. Like the others in the series, Infusion de Mimosa was developed by perfumer Daniela Andrier. 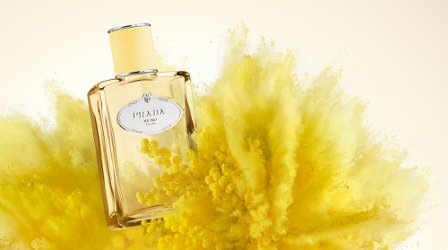 Part of the Les Infusions de Prada collection, the new Infusion de Mimosa is dedicated to the summery fresh and sweet scent of the Mimosa blossom. Under the creative direction and inspiration of Miuccia Prada, Les Infusions de Prada are blended by perfumer Daniela Andrier “Mimosa is like an emergence into yellow velvet. A multisensory experience.” The fragrance consists of essence of anise and Mandarin orange in the top notes with the floral heart of mimosa and rose absolute resting on a subtle woody base. Prada Infusion de Mimosa is available in 100 ml Eau de Parfum. Do you think it will be similar to Ostara? Doubt it — no reason this would smell like narcissus, plus, this will almost certainly be powdery. I think I might like to smell this one, if I could run across it somewhere. I am totally remiss — have not smelled any of the newer infusions. But since I didn’t like any of the older ones other than the iris, I guess I’m not that motivated — Saks is not convenient for me. Sounds like the sort of thing I’ll crave for about 3 and a half days in a dull February….. Went to a Prada boutique to test out the Olfactories and the new Les Infusions and was met with the expected snootiness from sales associates. It’s like a person wears a suit from Zara then works at Prada and decides to not to be hospitable. I hope they are not trained this way. But I digress. Mind the snark, the chamomile is working its way. The Amande seems to be doing well as it has sold out at the San Francisco boutique. I did observe that they had about ten tester bottles of the Amande. Curious! I did like the Amande though it was rather screechy on me. I recently started appreciating fragrances with mimosa so I will try to remember to test this. I’ll just put on my bespoke jacket with SnootGuard and I’ll be on my way. Oh the Tuesdays! I sniffed these at the Prada boutique… but they were just pleasant and quiet, could not justify paying full price for them. If they show up at an online discounter for $40 at some point I would consider it.